– Very good. Recommended. Primarily a poker magazine but in the past it included some good articles and information on blackjack. Noted authors have included Mike Caro, Mason Malmuth, Arnold Snyder and I. Nelson Rose. Arnold Snyder had a regular column in this publication for many years. You may be able to pick up a free copy in your local poker room. – Not recommended. Quarterly newsletter covering all aspects of gambling and risky money-making ideas. Jerry Patterson marketed the controversial TARGET 21 blackjack method and other gambling instruction via mail order and in casino cities such as Las Vegas, Reno and Atlantic City. Jerry Patterson has been in the blackjack instruction business since 1978 when he established Jerry Patterson’s Blackjack Clinic. Since then, he has abandoned traditional card counting instruction and has concentrated on marketing several controversial systems including TARGET, BIAS barometer and the NBJ method. He also teaches various craps methods, and a number of other gambling systems. [80 Casino & Sports Vol.10,23] for historical comments on Patterson. – Good. Recommended. This slick monthly publication started out in newspaper style format as The Player. It has lots of casino advertising but surprisingly has offered some good information on blackjack and related gambling topics. Contributing writers have included Mike Caro, Anthony Curtis, Michael Dalton, Peter Griffin, Mason Malmuth, Darwin Ortiz, John Patrick, David Sklansky, Stanford Wong and Arnold Snyder. For example, the January 1992 issue has an article by Arnold Snyder entitled “Blackjack in the Great White North”. Ace Marketing also publishes two trade publications: Nevada Casino Journal and the New Jersey Casino Journal. – Recommended with reservations. Quarterly newsletter in publication since 1974 when it was called the International Blackjack Club Newsletter. Lance Humble is the publisher of the Hi-Opt strategies. Although this publication is currently recommended players should be aware that much of the content of this publication (in recent years) has been a copy of Arnold Snyder’s and Stanford Wong’s material. Humble occasionally published an interesting reader’s letter and often promoted his harness racing strategies. – Excellent. Highly recommended for lower stakes players. Excellent “best deal” type reporting and jam-packed with current Las Vegas information. Curtis has even managed to coax some casinos to offer readers match-play and other free money coupons. 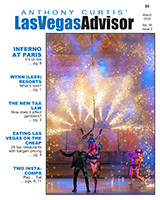 Reports the best deals in Vegas from food, lodging, shows, transportation and gaming. Earlier issues included more blackjack information than it currently does but well worth the money for your next Las Vegas vacation. The Las Vegas Advisor has been reporting on, reviewing, and analyzing literally thousands of legitimate deals, opportunities, coupons, meals, shows, and promotions, as well as the come-ons and outright rip-offs dreamed up by two generations of Las Vegas hotel-casino operators. The newsletter has never accepted advertising. – A casino industry type publication now written mainly for casino executives. Not currently recommended for players. Past issues, however, have carried an excellent coverage of blackjack and are worth reviewing. A full collection of Rouge et Noir back issues is available at the University of Las Vegas Special Collection area.